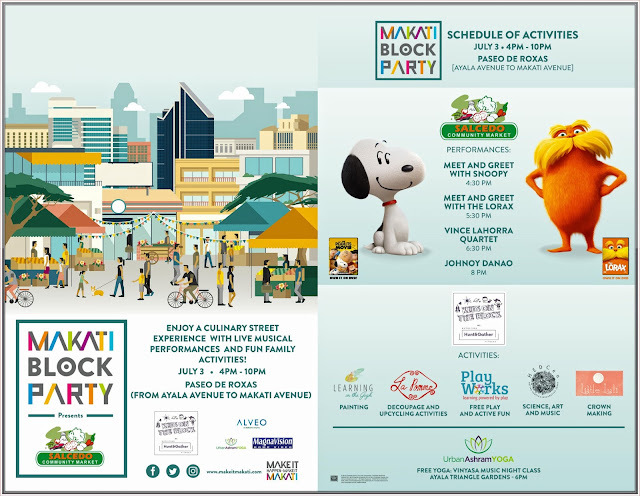 Mouth-watering gastronomic delights, a kiddie fun fair, and great entertainment await everyone at the Makati Block Party, which promises to delight everyone on Sunday, July 3, 2016. Capitalizing on the distinct Makati vibe and community spirit, the business district’s iconic avenues will be transformed into a culinary street party that will feature some of the most well-loved vendors of the famed Salcedo weekend market, a revered Makati tradition, and benchmark of all weekend markets around the country. Over the years, Salcedo Market has become the melting pot of Makati residents and guests who come over each weekend to relax and come together as a community. The Makati Block Party recreates this community spirit, and takes it several notches higher with the partial road closure of Paseo de Roxas, a major city thoroughfare, for this culinary street experience. For one afternoon, the city’s pedestrian-friendly streets will come alive with friendly banter and the street vibe that is distinctly, uniquely Makati’s. With the party happening footsteps away from famous Ayala Avenue landmarks, people can simply walk to take part in the community festivities. The Makati Block Party promises something for everybody, from 4PM until 10PM, Paseo de Roxas, the stretch between Ayala Avenue to Makati Avenue adjacent to the Ayala Triangle Gardens, will be transformed into a gastronomic festival centered on Salcedo Market, with lots of exciting activities synonymous to Makati’s hip lifestyle. A curated selection of Salcedo Market vendors will be on hand for a culinary street extravaganza as they serve up their signature offerings that people from all over Metro Manila come for every weekend – baked goods, artisanal delights, hometown favorites, and the most luscious concoctions whipped up by homegrown chefs and foodies. “We aim to create communal spaces where residents and friends can converge, so that we can bring the community closer together. Over the years, the Salcedo Market has served this purpose. The Makati Block Party builds on this tradition and takes it to the streets, with the hope to get the Makati community to use the streets more for activities and things that they love to do,” said Shiella Aguilar, Project Development Manager of Makati. Kids who tag along with their parents can look forward to fun-filled activities at Kids on the Block by Hunt & Gather. Let the kids discover their inner artist with art and crown-making sessions, or play to their heart’s content with interactive fun. For those who are just lounging around, musical performances by Vince Lahorra’s Quartet and Johnoy Danao will keep everyone entertained throughout the evening. As an added treat, Snoopy and The Lorax will be ready to meet and greet all the kids and young at heart. Wellness buffs and strained souls can find some relaxation with free yoga sessions at the Ayala Triangle Gardens with a Vinyasa Music Night Class by Urban Ashram Manila. The Makati Block Party once again showcases Makati as the go-to destination for the best food, entertainment and lifestyle offerings as it imprints a great community vibe. It also captures the city’s efforts to increase walkability in the area by providing activities that encourage people to actively use its streets. 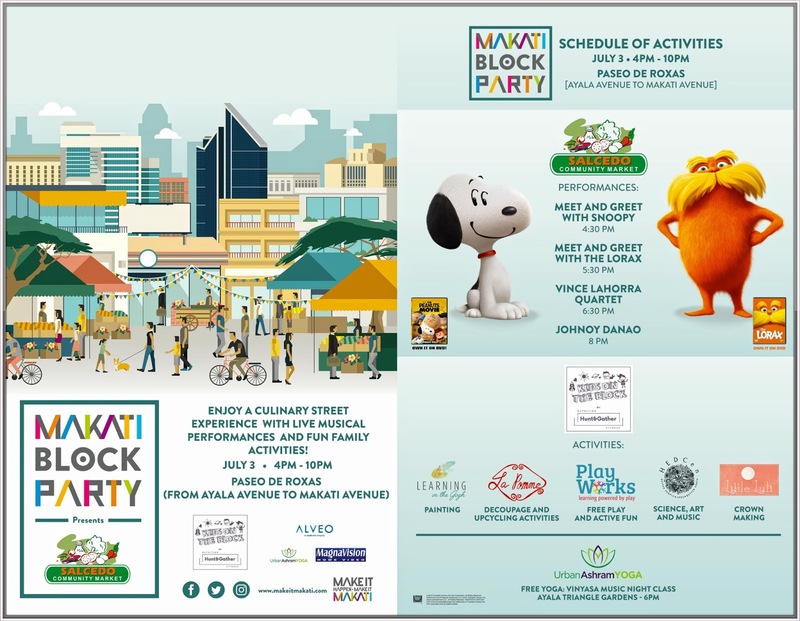 “The Makati Block Party gives residents and visitors something fun and relaxing to do, right in their own community, on a weekend. It’s our way of bringing activities and treats that residents love and enjoy, just a few steps away from where they live. We want people to discover that there’s lots to do and enjoy just by walking and exploring the streets of the city,” said Aguilar. Participating food vendors are Down to Earth, Uncle George Gourmet, Plaza Ilocandia, Sabor. Bun Appetit, Dela Rosa's Deli, La Cuisine, Real Girl Toy Kitchen, Connie's Kitchen, al halabi, Jiro's Lechon, Delicane, Authentic House of Curry, Mgourmet, Merry Moo, Johanna's House Of Lumpia, All best Organic Juices, Gostoso Piri Piri, THC, Don Churro, Michelle's homemade putong ube atbp.,Grace Pate, Rita's Kitchen, Bersi Gyros Shawarma, Tuna Town seafood place, Stanford Shaw Brew, Cheryl's Cuisine, Antipolo Delicacies, Bats Tilapia, MCV Trading, and Haici Food Services. Kids On The Block activities by Hunt and Gather include Painting with Learning on the Gogh, Crown Making with Little Luli, Decoupage and Upcycling Activities with La Pomme Home, Free Play and Active Fun by Playworks ECC, and Science, Art and Music with Hedcen. The Makati Block Party is supported by Alveo, Magnavision, Urban Ashram Manila, Hunt & Gather. Admission to all Makati Block Party activities is FREE on a FIRST-COME, FIRST-SERVED basis. For more information about the city that makes it happen, visit www.makeitmakati.com or like and follow Make It Makati on Facebook, Twitter, and Instagram.